During the war, Manuel de Falla wrote a pantomime ballet titled El Corregidor y la Molinera (‘The Magistrate and the Miller’s Wife’) based on a novella by Pedro Antonio de Alarcón. Sergei Diaghilev, founder of the Ballets Russes, was at the 1917 premiere. Liking what he saw, Diaghilev imagined that the ballet, with modifications, would be perfect for his then eight-year-old company. Falla accepted the commission, and the new ballet, now called El sombrero de tres picos (‘The Three-Cornered Hat’) was premiered in London in 1919. 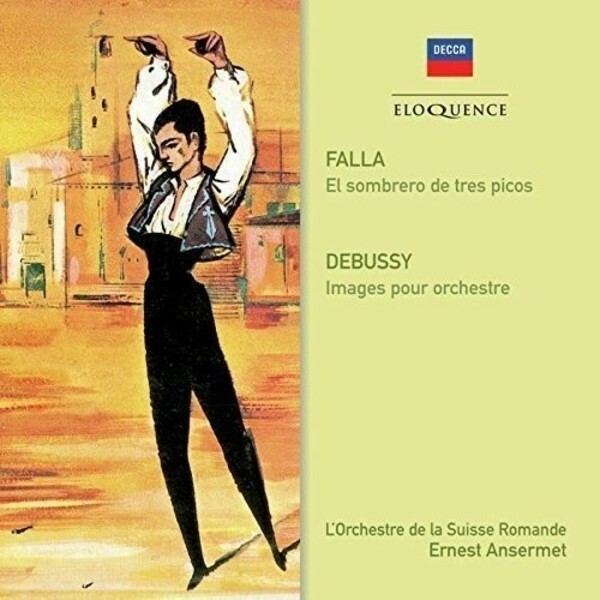 Diaghilev had intended to have Falla himself conduct the ballet, but the composer quickly realized that he was not up to the task, and so the responsibility went to 35-year-old Swiss conductor Ernest Ansermet, who had conducted the Ballets Russes since 1915. It has been stunningly re-mastered for this reissue and is coupled with Debussy’s highly picturesque triptych Images. This continues the much-lauded Ansermet Legacy on Decca which has systematically mined the Decca archive for re-issues of much valuable material, some of it released on CD for the first time.